I spotted this sign on Friday in Glasgow as we were heading through an open gate towards the tall ship for the start of cycle photographs. 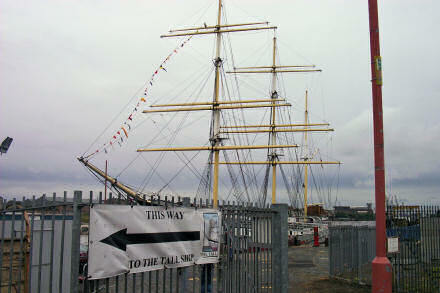 This way to the tall ship. and the arrow points in completely the opposite direction. Well, it made me laugh. 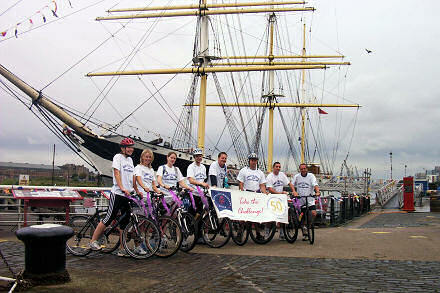 The D of E cycling team pose for a photograph in front of a tall ship at the start of the journey. Well, she managed it. Jane and the rest of The Duke of Edinburgh’s Award team cycled the 60+ miles from Glasgow to Edinburgh yesterday in a respectable 8 hours. Very many thanks to all who supported her. Jane is now recovering from slight sunburn on her arms and sore knees. The bike is still in the back of the car!